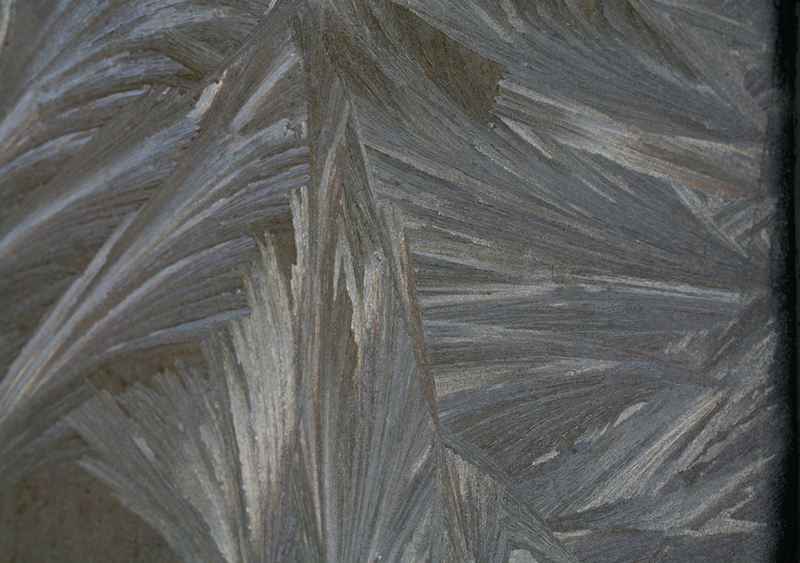 More ice crystals on the window. It only seems to happen when the humidity is just right. 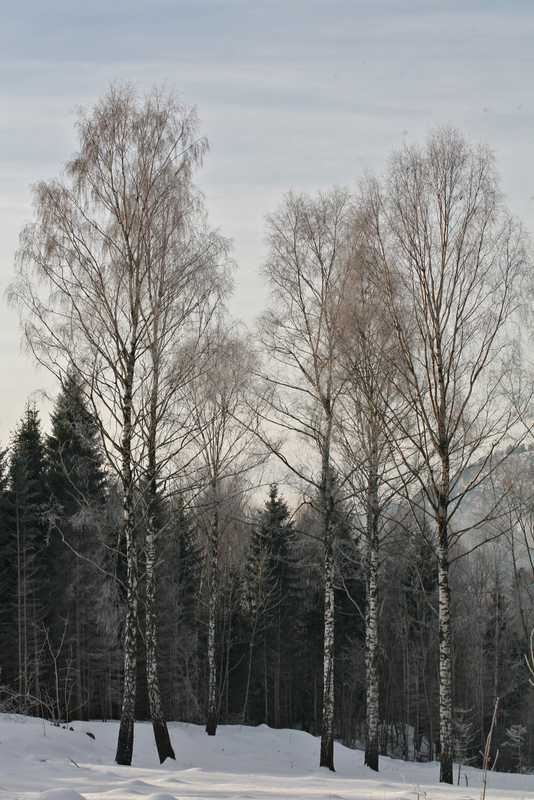 These are birch trees. Did you know that Bjørk, the singer, shares her name with the Icelandic word for birch? At least, I’m assuming she does; it’s certainly the Norwegian word for birch, but maybe in Icelandic bjørk means cheese or volcanic lava. I don’t really know any Icelandic, I’m just guessing. meaning “the shining white (thing), due to the color of the bark”. Another German word for bark is Rinde. This can also be the rind of a cheese (say). In case of potential misunderstanding in a given situation, you would say Baumrinde for the bark, and Käserinde for the cheese rind. A situation in which you want to say: “the rind of this cheese looks like bark”. Yeah, you never know when that’s going to come up. Forms: α. 1 berc, beorc (? beorch), byrc. β. 1 birciae, byrce, birce, 3–6 birche, 5–6 byrch(e, 4– birch; north. 4–5 byrk(e, 4– birk. …The plural birks is often used in the north in the name of a wood or grove of birches. ” the northern form birk reaches to Morecambe Bay and Lincoln…”: jolly good; I’m always glad to know where it reaches to. Does it mention where it reaches from? Or what’s a heaven for ? I used to field second slip, so I don’t suppose that applies to me. Whereas the Midlands berk, according to my dad, reached from the factory floor and took in the clientele at the pub and the remainder of his family, that feckless throng of drooling imbeciles who each night awaited his precious homecoming. And, of course, we visited Iceland many times, where else was cheap enough to do our shopping. Apparently, Björk, Eik, Einir and Ösp are all allowed. But not Beyki. Grumbly, the OnlEtymDict says that “bark” meaning tree-skin is probably related to birch and Low Ger. borke. The first three pictures ate drawings, aren’t they? Don’t pretend that they are mere photographs of something which developed by itself. “The first three pictures are drawings.” Sorry, big fingers. I was made like this by the Creator and I can’t do anything about it. I feel like moving to Iceland and changing my name to Beyki – or possibly the other way round. Sig, the nicest thing about the crystals doesn’t show in photographs. As you move, you see different light refractions; so the parts of the image are always changing slightly in brightness – it’s what we scientists call “twinkling”. I didn’t know Iceland had cheap shopping. Berk comes from rhyming Berkeley Hunt. So why isn’t it “bark”? Birch in Spanish is “abedul”. I’m not sure if I could differentiate a birch (abedul) with a poplar (álamo). Well, in fact, I’m pretty sure I couldn’t. I need some field research! 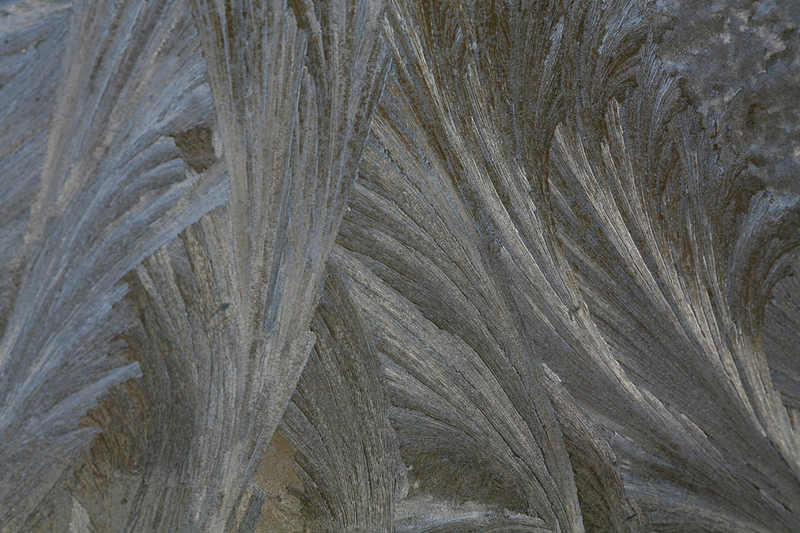 These ice crystals look like art decó designs, don’t you think? Yes, they do look deco. My pictures don’t do them justice, and now they’ve melted. I find in the summer when they have leaves that the big old birch look like eucalyptus – I don’t know if you have those in Argentina? There aren’t any álamo here, I love the long avenues of álamo they have in France. “I love the long avenues of álamo they have in France.” We were a little surprised to see quite a few such lines on the Canterbury Plains in NZ. There’s also a short line of them a few gardens away from us. I likes ’em. I was hoping some more might be mentioned. Didn’t you see a kakapo in NZ, dearie? In places of the Patagonia where they grow fruits, poplars put in line are used as “curtains” to protect the fruit trees of strong winds. Julia, as I remember it from Mexican Spanish, “quinta” is a “farm” or “country house”, or (if the house is large, surrounded by hundreds of acres and and inhabited by dozens of rich people) a” country estate”. Yes, thank you, Stu. I was lazy to look for the word. It was more as a country house. In fact it still is, we¡ve been trying to sell the 20 ha. for years… Anyone is interested ;-)? The house is destroyed now, but the trees are fantastic. What’s wrong with it? 29 ha. sounds like an estate, or is that estancia? No, that means “ranch”. So is “quinta” sometimes a hacienda? I’m thinking Grumbly can move there and grow something-or-other. I’d say olives, but I know it takes 100 years before the trees start to produce fruit (assuming they grow there). Too bad about the house, it’s lovely in the picture. I don’t think we did see a kakapo – I think we’d remember if we had. We did see a kea – a big flying parrot: we stopped at a pull-off on an Alpine road and a one-legged Kea gave an entertaining display and then attacked someone’s car. They look interesting, I wonder whether they’d like Norway. I see one’s pecking the rubber around a windscreen in the Wikipedia article, our little parrots did that on the house windows; it must be beak exercise. Superb “pix” (comme il dit), be their origins Aryan, Teuton, or swan-in-a-tutu. Photos two and three, lovely examples of expressive-naturalist phantasmagoria out of some advanced art movement of c. a century ago, Paris, Berlin (Die Brücke)? Macro-view of a Kirchner brushstroke, perhaps? 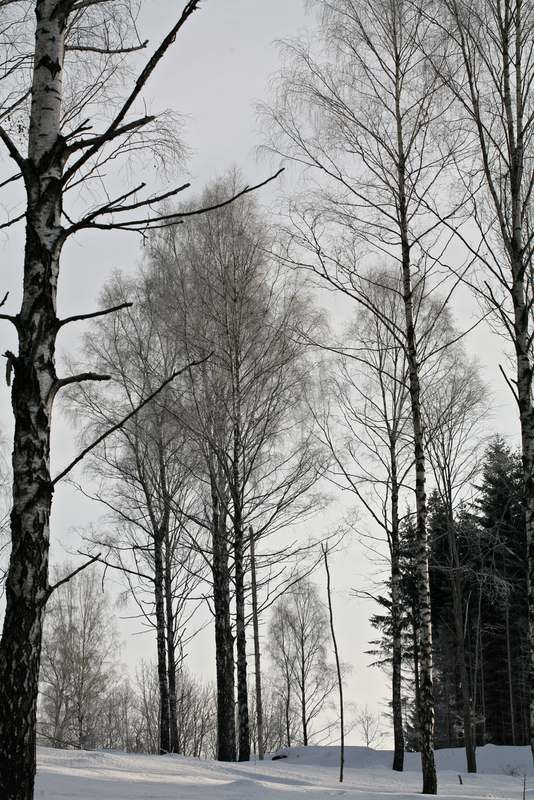 Artur, some time back you threatened to stretch your verticals to the limit, and I think the remarkable tall thin birch may be heading in that direction. Splendid, in any case. Thank you, Tom. And likewise, you have marvelous pictures up on your blog, though very different. I thought that those looked like brushstrokes too. It’s odd that they seem to be in overlapping layers; I wonder why they do that? Crystals work in mysterious ways their wonders to perform. I’m glad you like the treetrunk. As you say, I thought “What the hell, I can put up anything as long as it’s only 8 cm wide”. There doesn’t seem to be a length limit. What a remarkable memory you have, I can’t remember having mentioned it. 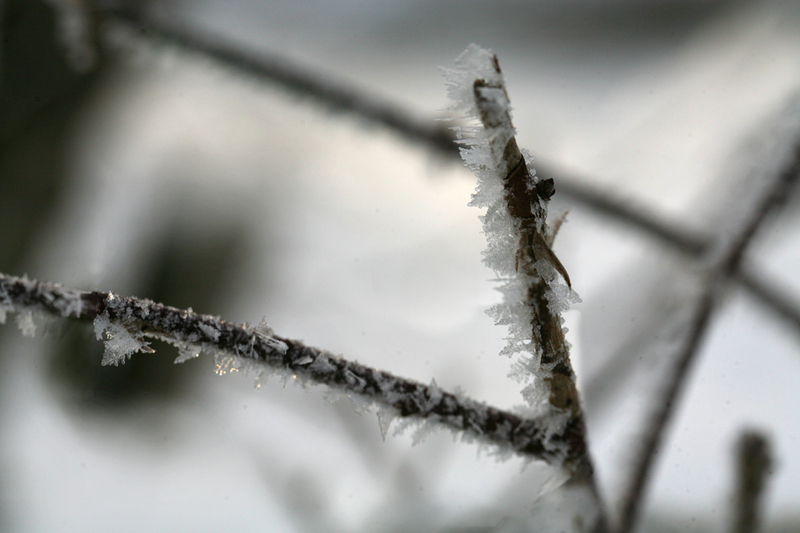 “Crystals work in mysterious ways their wonders to perform.” The all-purpose explanation “it starts from an imperfection in the lattice” is often invoked. That’s right, we have an expert. Thank you, dearie. Do you mean that olives need 100 years to produce fruit? 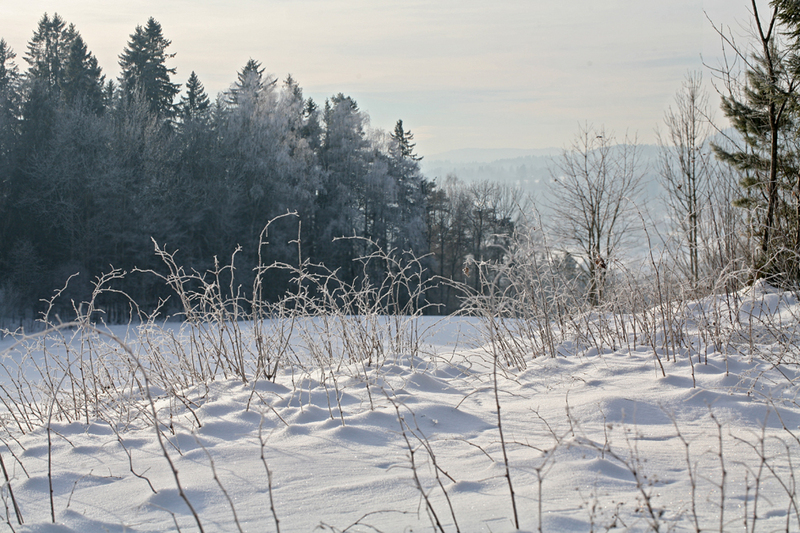 Der Blumen im Winter sah. The all-purpose explanation “it starts from an imperfection in the lattice” is often invoked. Crown, so you mount latticework on your windows in winter ? The epitome of chic ! I thought it was 30 years for an olive tree to bear its first olives. Normally the olives trees start to bear when they are 4-5 years. Then they bear a good crop after 30 years. Oh, good. I’m no expert, I just eat them. Perhaps I was being too pessimistic, so let’s say somewhere between 4 years and 100 years: it’s a half-full, half-empty thing, really. Well quoted, Ø! I’m very impressed that you knew that – I certainly didn’t – and how appropriate it is to the pictures. My mother’s family call this house “quinta” because it was their week-end house. The lands are a bit large for just a “quinta”, but they actually never gave too much use to the rest of the land as for call it a “ranch”. And in fact is too small for a ranch around here. and also longer one in Spanish. Oh, God! How annoying I am! Thank you, very interesting. I like the maps. I think I want a hacienda, with some animals on it: donkeys, horses and goats. And kangaroos and parrots if possible, but it’s not a deal-breaker. As long as I can get olives at the store, that’s enough. I’m not sure Stu should become a property developer. I was thinking more about finding him a place to retire and keep bees. But he can decide. Yes, you’re right, I’ll just pretend we’re in the Andes. You can probably wear white charro outfits in the snow, but the black ones would look silly. Hey, hey, hey! Wait a minute! This is Argentina, not Mexico! And above this tiny matter of kilometres, people from Buenos Aires is extremely conscious about ridicule. Yes, I found that, but I have absolutely no idea. I also found this Rafael Benitez is or was a football player. Not clue at all. Though going back to my previous, previous, comment: please don’t you ever dare to come here with a charro outfit! “Lowdown” – solo la explicacion de la frase y no mas. Si, el es un tecnico. Y, por supuesto, no fue mi intencion para sugerir que hay tanta gente en BA en el traje de los charros. Yo y AJ seamos pistoleros! !jajajaja! I’m just acting, pin! In fact you can come to BA in whatever outfit you want… you may be criticized, certainly. Criticize is our speciality after (or before) the beaf, the tango and the “mate”. I think you just invented a cool new word for a deaf cow. “mate” ??? Que es eso? Una visita, perfecto. Donde esta mi chumbo? Maybe some particular beef is from a deaf cow, how would you know? And with acting I mean “performing”, is that correct? To me it’s always cafe and I have found a place here that imports beans from Huehuetenango, the site of the best fincas in Guatemala. Acting / pretending may be closer than performing – what verb would you use? mostrar? actuar? I can’t remember. We also have kidding as an alternative to joking. Duh, I hadn’t thought of that as the origin. Thanks, Jesús. Neither do I. I’ve just invented that. I think R. Benítez compares the colors of sugar and the cassock. With “acting” I was wanting to say “actuando” (in Spanish) not just joking but acting as if I were offended by your mixture (charro, Argentina, Mexico). Of course they must have wonderful café in Guatemala! And now that Jesús is back here, we should ask for his help, don’t we, AJP? Remember canehan’s enigma? I am just reading Octavio Paz and his Labyrinth of Solitude, Julia, is there a similar work that performs the same service regarding Argentinian history and culture? I don’t think there is anything comparable with Octavio Paz’s book. And I’m afraid our history it’s not even half as long and rich as Mexico’s. But I’ll transmit your question to someone not so ignorant as myself in Argentine’s literature . We’ve come a long way from crystals. AJ should read The Crystal World, so very beautiful. MMcM: Apparently, Björk, Eik, Einir and Ösp are all allowed. If Eik is allowed, would Ekki be too? 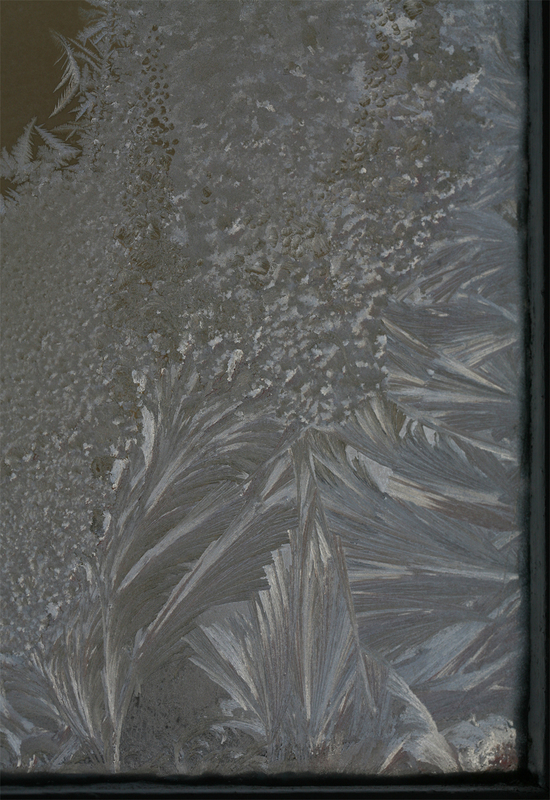 AJP, is this ice forming inside the window pane or outside? Regarding Icelandic, maybe Askur could be of some help. Inside. I now realise it’s caused by warm air from the clothes dryer in the bathroom condensing on the cold glass. Askur doesn’t remember any Icelandic, he’s actually pretty quiet for a horse. But I still like him best. Ekki sounds interesting, I hadn’t heard of it. Do you grow and/or use it in Mauritius? Over here we don’t use hardwoods like that any longer; it’s because of the rainforest being depleted, but I guess you lot can always just plant some more when you cut them down. By the way, Pinhut looks a lot like Colin Firth. I’ve seen a picture of him. It’s great you showed up. We had a question for you at another blog. It’s here (the last three paragraphs) and the comments. With all due respect, Mr. Crown, I’m not looking for substitutes. Thanks for taking a look, Jesús. Anyway, I understand that the problem is the expression “wire brush” with “ stay”, isn’t it? Yes. An English speaker was coming to stay in Barcelona, and someone wished him a “wire brush stay”. Could it be a translated Catalan expression, maybe? Of course I myself don’t dare doing it. Could a wire-brush stay refer to a stay long enough that you have to clean your hush-pupopies? Yes, I know… but, will he? Yes, sure. He’s always sending things in to Steve (Language Hat). We’ll ask him tomorrow. And I’m sure he will, but if not, we’ll do it. We’ll get you an answer somehow, Julia! Thank you, I never expected less from a great-bad guide as you are! Off-topic: This opinion piece from today’s Boston Globe, about lousy communication between doctors and the effect on hospital patients, is very timely for me. For the last five days my 84-year-old mother has been hospitalized. My two sisters and I, with much valuable advice from my wife (who is a doctor), have been working hard to coordinate her care. It has been maddening at times. She is on the mend, and will be out of there tomorrow, headed for a few days in a rehab center. At this point her main problem is a cracked rib, which she incurred quite unnecessarily while in the hospital. In general I am pretty unknowledgeable about serious arts of all kinds. One of the isolated oases or clearings or high points in the desert or jungle or vast plain of my ignorance is Schubert, or at least <Die Winterreise. This is because once long ago, when I was on an extended visit to Germany to think and talk about mathematics, my host and I discovered an extra-mathematical shared interest: he loved to play the piano and I liked to sing. My skill at reading both German and music was sufficient for me to hack my way through some of his favorite Lieder, and we spent many happy hours doing so. So I became a bit familiar with this particular set of music, by doing rather than just listening — which makes such a difference. Sorry to hear about your mother, empty, I hope she will recover soon. Incredible story in the Boston Globe. You have a doctor in the family, but have you got the necessary lawyer? And now we need a video of your “lieder skills”. Yes, get well soon, empty’s mum! Worrying stories for all those of us with 84-year-old mothers, (though having had diabetes for nearly 50 years myself the Globe story about hospital staffs not communicating strikes me as typical, you really need to write the main points with a marker on the patient’s forehead). In the mid-eighties a friend of mine, a doctor, was working on an idea for getting your medical history put on a plastic credit card that you’d carry around; you’d get a computer update added every time you were treated for an illness. It sounds very simple, I don’t know why it never has happened. Schubert is definitely one of my favorites next to Beethoven and the Trout maybe my favorite piece of music of all time. But Beethoven lived much longer and so had more time. It’s been on my mind ever since I too became 57. Seurat is the other one from the 19th century who I wonder what he might have done if he’d lived. Julia, I sent messages to Canehan & Language Hat. “Die Winterreise.” My wife is fond of that. Unfortunately. You ought to learn Greman, dearie. That or German. I have a certificate that says I can read German. I could at the time. There’s not much left. “Die Schwefelsaure ist im Schrank” is about right. I even know where the umlaut goes. I can still read French, but my ability to speak it is largely gone. My Latin is fragmentary. Woe, woe and thrice woe. Though that may be more Frankie Howerd than Classical. But do you still field second slip? Me too, dearie, on the German front. “Wann kommt der nachste Zug nach Bremen?” That’s about it. I lurk on the boundary rope, as close to the pavilion as possible, first shot at the tea… my finest moment came at the delightfully named Ipplepen. A fielder after my own heart. Closer and closer to the boundary until you can run away. I did run away during one match. They asked me to umpire and I, quite impartially, gave out our captain, who was proudly using a new expensive bat, for 1, lbw. A rather contentious decision, it transpired. Due to the skipper pausing to badmouth me publicly on his way back to the pavilion, when lunch came, I simply walked in my umpire’s coat to my car and drove off. I once gave our skipper out, caught down the leg side. He was an Aussie and claimed it had hit his pads. I suggested that his next pads shouldn’t have wooden buckles. Giving out to our own side, especially Australians, it’s how we won the war. Look, AJP, more news from Ushuaia. This summer (or winter) the most austral city of the world seems to be really IN. Ipplepen is a very nice place name. This obscurely reminds me of Goldenacre. I am happy to report that the wildlife report is still in the Wiki article. I never said anything about skills. I did venture to sing two of the songs (Der Leiermann and Der Lindenbaum) at our church’s annual talent show one year, but I think I am happy that there is not, to my knowledge, any recording. I’m not at all sure that if Dearieme studied German he would appreciate the Winterreise any better. My impression is that these poems would be forgotten if Schubert had not set them to music. They are of an exaggeratedly Romantic kind and must have a limited appeal to modern sensibilities. But I get a sort of kitschy/campy kick out of the poetry, and I just love the interplay between the voice and the piano. The cricket story, apart from it incomprehensible jargon, reminds me of the occasion, during my son’s brief baseball career — he was maybe eleven years old — when an umpire made some very unfair calls about the pitches he threw and later apologetically explained that he had to do it because his own daughter was batting. Oh, hell, some html bracket problem. By the way, my mother is out of the hospital. Big snowstorm here. My sister conveyed Mom to a nursing home where she will spend a few days. (Hospital near Mom’s house. Nursing home near my sister’s house, and pretty near our house. Should have been less than a 2 hour drive, probably was twice that.) Meanwhile I determinedly drove fifty miles to work today to teach a class in the morning, and then in view of the severity of the storm cancelled my other appointments and more or less immediately drove home. (Again taking about twice the usual time.) Then dealt with snow and ice on roofs and driveway and walks for about 4 hours. My jeans stayed so wet for so long that my underpants turned blue, and I have only just now noticed that I’m not cold any more. That’s all italics, too. I give up. That was a brackets virus. I’m not sure what caused it to spread like that. It disappeared immediately I removed the one i/ typo. the most austral city of the world seems to be really IN. Yes, that’s funny because Longyearbyen in Svalbard, the most northerly city in the world, is a very trendy place too according to my wife, who did a job up there – actually I think they were trying to get Bill Gates to go. Places for those who’ve been everywhere else, next stop the moon. The village’s second public house (‘The Plough Inn’) was closed in January 2009 and then put-up for sale, it was adjacent to the Conservative Club. There’s more to that story, don’t you think? A warning to take it easy with the snow shovel. I’m glad your mother’s out of hospital. The year of the rabbit has commenced, I wish everybody well, and that their underpants should refrain from further changes of colour. Thank you, and likewise. What colour were they to start with? I’m just assuming it was white, but who knows? You were on the right track, Jesús. Well done! Now I think about a bad translator online. It seems not to be a problem with the Catalan. As you imagined, I don’t speak Catalan. Anyway, “gratificante” is “gratificant” in Catalan. I swear that I am not guilty about that despite my mangled English (LOL). Oh! A work in vain. If we hadn’t asked Language Hat yesterday, you would have won. Too bad, because the prize was a trip for two people around the universe. First class. Better luck next time! Jesús: lo lamento ¡llegaste tan bien al camino correcto! Por lo menos tenés la satisfacción de que la inteligencia estuvo de tu lado. Now, we have to sacrifice, and go ourselves. Do not forget your towel! The last thing I’d planned for today was a trip round the universe. Good, because the trip is not today. (That was a line from a commercial on British children’s television in the 1960s. I don’t know what it was advertising, but I’ve always remembered it.) Do they have A Hitchhiker’s Guide in Spanish, or did you read it in English? Oh! I was joking. I congratulate Tom Recht, of course. And I confess that I didn’t know that meaning of “grata”. “Ha sido grata mi búsqueda porque he conocido otra acepción de la palabra grata ¡gracias al inglés!”. ohh, you know…I just missed it! There. Study is its own reward. You can all have blue underpants. All it takes is white underpants and some patience. Incontinence patients, that is. White underpants turn yellow. Leave’m like that and they turn blue. I don’t take gratificacion by metal brush. My husband is a big fan, he read it many times and made me watch the film. And I like it very much. Ah,the proper answer: I don’t think there’s a translation yet. He (my husband I mean) reads a lot in English, specially those science fiction books to which he’s so fond. Now he’s enjoying some Terry Pratchet’s. Regarding the underpants, just buy blue ones. Julia, the reason you don’t get all my comments may be because I often change them after I’ve written them. I don’t think changes are added to the emails; but I don’t read that way myself, so I’m just guessing. Yes I thought that. Have you changed this one? In my box mail it only goes up to “blue ones”. Yes! I did. That must be it, then. They may, in fact, turn bluer. You may not notice though. It would also disguise Trond’s problem. Another mystery solved this week. It’s very kind of you to think ways for helping Trond with his problem. He was so brave to share it here with us! But we won’t mention it again. Certainly not on other blogs, Trond. Or on… Wikipedia. I’m not in trouble, urine trouble. Some people are willing to dye for blue underpants. But don’t forget yellow is a complementary color of blue so if the amount of blue is lower you don’t have the desired effect. For that reason, the detergents usually have some blue particles: the optical effect does more white the laundry. Wish I’d known this before I went to the hospital last week. Hospitals are on the lookout for different-coloured pee. Purple or red are symptoms of porphyria (George III disease). The blue disease is, par excellence, the cyanosis. Out here, cyanara, I suppose. cyanara – it’s me combining cyan with sayonara, it’s how you’d say goodbye to a case of cyanosis. saludicrous – this is when you feel ridiculously healthy. I use cyanara in the laser printer. It’s a little fuzzy, but it basically works and it’s much cheaper and more eco-friendly. CYMK – that gnomic agglomeration. It is gnomic. What’s K, again? Kill? Kolostomy? Kipper Orange? No, it’s “Key”. K. Ever since Kafka, no K, is devoid, for me, of horror. Evil Kneivel probably played his part, also. I could have told you Caledonian ostriches make lousy farmers. Ostriches ostracize ostensibly obstreperous farmers. After trying to say that several times, I find myself unable to pronounce the word “ostriches” any more. In Norwegian it’s called a “struts”, which I really don’t like, not that anyone cares. Is it something like that in German? It’s Zungenbrecher, a tongue-breaker. Do you not like the “struts” phenomenon, or the word “struts” ? Pronounced “struhts” or “stroots” ? I find the name a bit too judgmental. It’s pronounced “stroots”, with a trilled R (and no German “sh”). Is it something like that in German? I find the name a bit too judgmental. But “tongue-twister” isn’t judgmental. So what does the Norwegian “struts” mean ?? Wait a minute. Does “struts” mean ostrich ? Do ostriches sit in judgement ? Struts means ostrich. I think of it as a comment on their strutting about instead of doing a normal walk, but I’m probably wrong. So in Norway a tongue-twister is called “ostrich” ? I have the sense that I have overlooked a crucial transition in the discussion here. Der Vogel Strauss und der Blumenstrauss: The former is related to Norse struts and English ostrich (but not to Italian istriche). The latter is related to strutting your stuff. Never the twain shall meet. We’ve been through all that. Yes, the u-trow were originally white. The next day once again I got soaked to the skin while dealing with ice and snow and remained that way for hours. This time it was more about the fact that it was raining, and less about the fact that part of the time I was on the roof sitting (partly to reduce the risk of falling off the roof) in the snow. But this time the bluing effect did not occur. A less dye-absorbent undergarment? Or a pair of blue jeans more prone to run than the others? Perhaps I’ll never know. Perhaps I don’t care. The amount of snow that I have been shifting lately, I keep thinking of the word Stakhanovite. I see that I mixed up “less” and “more” in my second to last comment. This is a sign of my state of mind. I immediately discovered that it was in fact broken. Either my son is clairvoyant or he has dangerous telekinetic powers that he is going to have learn to control better. Less IS more – more or less, depending on how tidy you like your life. I keep thinking of the word Stakhanovite. I didn’t know this word. It seems like it should lead to an almost inexhaustible supply of satirical fiction, but Wikipedia only cites about four books.